Downs Side Up: Top tips for speaking live on BBC: toilet roll, rescue remedy and your husband's pants. Top tips for speaking live on BBC: toilet roll, rescue remedy and your husband's pants. 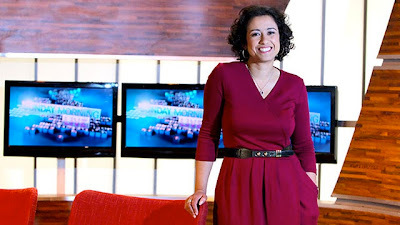 Yesterday saw my first live national BBC TV interview on an emotive subject via Skype, as I contributed to a discussion on disability abortion law and screening for Down's Syndrome on Sunday Morning Live hosted by Samira Ahmed. Nervous doesn't come close. Honoured and proud, determined to make every word count, yet scared of who would be on the panel and the questions they might ask, yes. But more a faint shade of petrified I would say. And live. Did I mention it was live? Oh, and did I also mention I have a deep-rooted loathing of Skype (other similary offputting online video conferencing applications are available). I like to see the non-verbal cues going on in a room when I speak to people. Oh, and no-one looks at their perkiest no matter how much slap you apply do they? Don't run out of rescue remedy 24 hours before. Prepare thoroughly even if it means staying awake most of 2 nights. Don't over-prepare, it won't seem natural. Apply even more blusher than your children do when giving you a make-over on a rainy Sunday afternoon. Try to tame locks you didn't have time to straighten with some hair oil. Don't apply too much hair oil or you may look like you need to be appearing on Aggie's Grimey Hoarders or similar. Cellotape key notes to your laptop screen but not actually OVER the camera hole. Get all your points in, starting with the most important first. dainty court shoe one size too small. Bring earphone cable to ears from behind your head to give a more professional air. Check the sound levels aren't too high BEFORE inserting earphones and pushing them home. Don't swear at the headphones while the researcher giggles at your efforts to remove the aforementioned objects and bring hearing levels back to normal by waggling fingers in your ears. Very unprofessional regardless of how cable is hidden. Stock up on toilet paper, for extreme nerves do have a very curiously unpleasant effect. Realise that 2 minutes before you go live is not the time to need to visit the loo again. Don't listen to friends who tell you to wear your husband's pants on the bottom half just to lighten the mood. If your extremities begain to go numb and you feel faint, drink water, run round the garden and force down a rich tea finger. But not if it's 2 minutes before you go live. switch mobile off, silence the dog with a chew. Remember to record the correct programme and not miss the first half off somehow. not to record the show. Don't watch yourself back on iPlayer, you will be your harshest critic and spend another night wishing you had done it all differently. You can watch the episode here for 6 more days. The abortion debate begins at around 20 minutes into the programme. Excellent tips! Ever thought of a sideline as a media trainer? But You Did It! Yea!!!! Thank you darling. I promise I didn't really pick my nose.... or did I?